Courtesy of World Coin News Staff Posted on March 20, 2019. The American War of Independence achieved top billing at Dix Noonan Webb’s late February coin and medal sale. 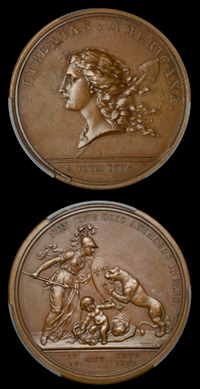 On offer was a 47 mm bronze medal engraved by Augustin Dupré celebrating the impending independence of the United States. The design is credited to Benjamin Franklin and Esprit-Antoine Gibelin. The obverse shows a bust of Liberty complete with flowing hair, liberty cap, and staff. The reverse has Minerva, representing France as indicated by the fleur-de-lis on her shield, fending off the attack of the British lion on the baby Hercules, who represents the newly emergent American nation. Hercules is strangling a serpent in each hand. The snakes stand for the British armies defeated at the critical Battles of Saratoga and Yorktown (Betts 615; BDM I, 647). The two dates with a common month, 17 OCT. 1777 and 19 OCT. 1781 in exergue, signify the American victories at Saratoga and Yorktown. The medals were minted in Paris in gold, silver, and bronze with restrikes made at a later date. Copies were given to the King and Queen of France, the Heads of State of countries friendly to the United States, and important U.S. politicians. The medal is rare, and in PCGS MS62 BN with just a few inconsequential marks was something of a steal when it realized just $17,435 [£13,200] on a not unreasonable £15,000-£18,000 estimate.